The old wives tale of putting butter on your cat’s paws to stop them returning to the old house is unfortunately not true. The logic behind the myth was that by the cat licking off the butter from their paws, they would remove the scent of the old house, and prevent them from finding their way back and subsequently adjust to the new home quicker. In lieu of this, we have a list of do’s and don’ts that will help your pet adjust more easily. Do see if a friend could look after your cat on moving day and possibly a few days afterwards whilst you get the house set up. If you don’t have someone who could cat-sit, you could look at booking them into a cattery for a few days. If you do decide to use a cattery, make sure you book well in advance and that your cat is up to date with vaccinations. 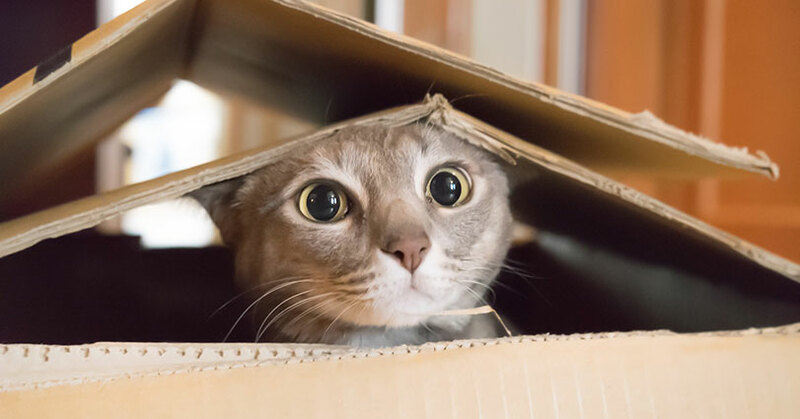 However, if you’d prefer to keep your cat with you during the move, keeping them in one room on the day of the move with the doors closed, so you know where they are and are safe is advisable. Do make sure your pet’s microchip and ID tag have the details of the new house on them. If they don’t already have a collar, consider buying one and having your address engraved on the tag. This is really important especially for the first few weeks and months where your pet could potentially try and make their way back to the old house (with or without buttered paws). Do leave your cats possessions to last when packing up to move. Having familiar things around them will keep your cat calm. It is also a good idea not to wash any of their toys/blankets until you have been in the new house a few weeks. This will give your cat some time to adjust to the smell of the new house. Don’t feed your cat just before the big move. If they are feeling anxious or get travel sickness, this could increase the chance they could be sick in the car. Don’t expect your cat to immediately adjust to their new home. It may take a few days, if not weeks or months to fully settle into their new surroundings. Don’t be angry if your cat scratches at furniture in the new house, or doesn’t become immediately toilet trained. Moving can be stressful and disorientating, and it may take a few days for your cat to adjust. For info on moving house with your dog, visit our previous blog.